New course format at a new site with a new group of students. 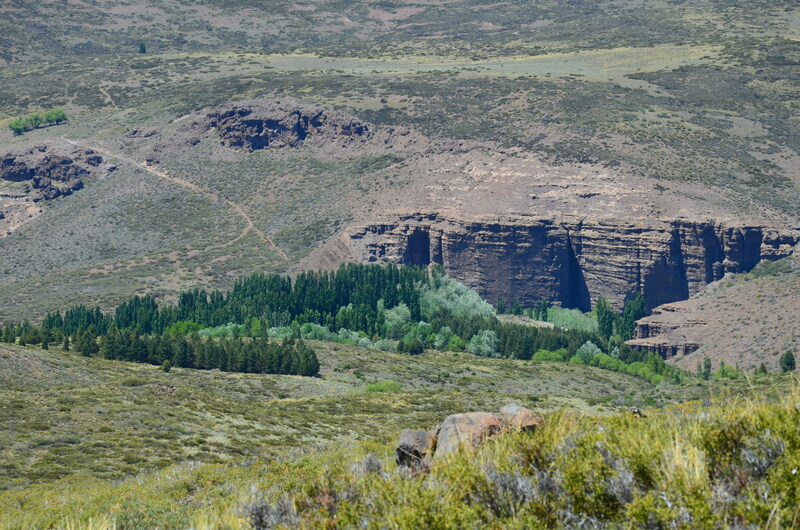 Our first PDC at Estancia Ranquilco in Patagonia, Argentina was our first attempt at the 16 day format. While it does make the marathon longer, the format does allow for more wiggle room so to speak. It gave us time for more hands-on, deeper diving into the design process and the final design, and more time off to explore the beauty of the property. Furthermore, we had a good time, adjusted to the surprise inclimate weather, and learned a lot throughout the course. 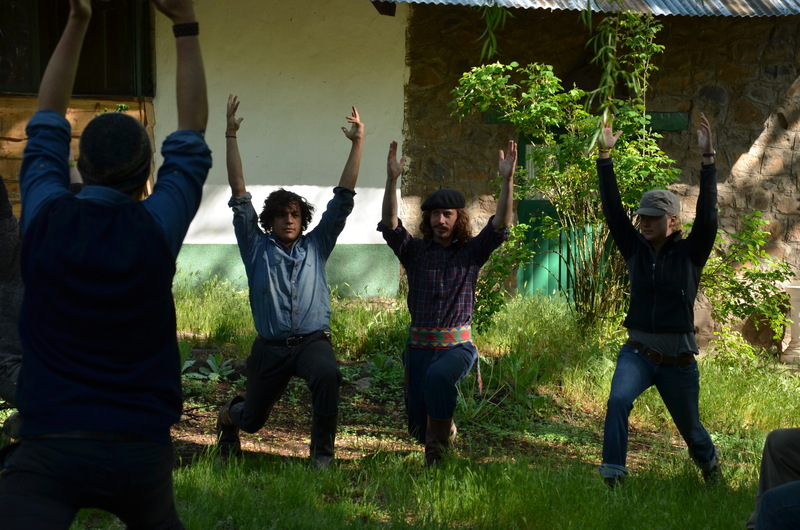 This course also included maintaining the organic gardens that we originally signed up for way back when we decided to explore new avenues in South America. With extra time to do hands-on we had an extra long session of garden implementation that normally we don’t have time for and that helped us towards our overall garden goals. 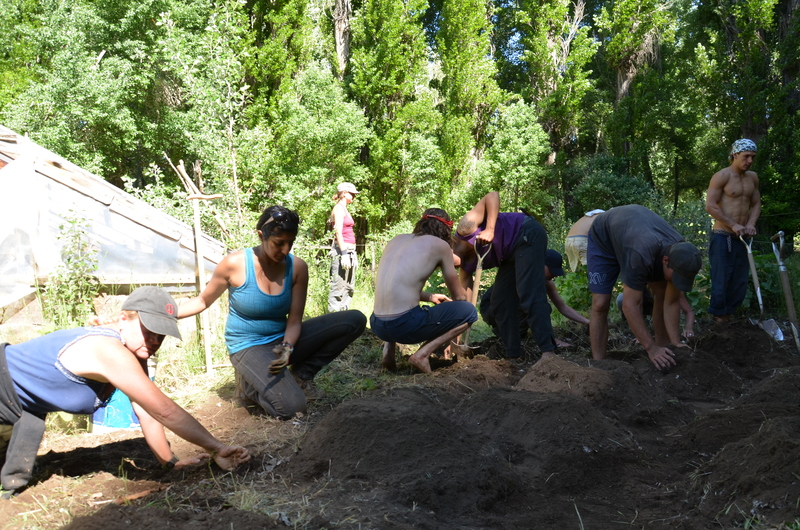 We still accomplished our normal compost pile making and subsequent flipping, plant propagation, and food fermentation in other sessions. However, the extra long session resulted in an implementation of milpa (three sisters) as it is known by the indigenous of Mexico. 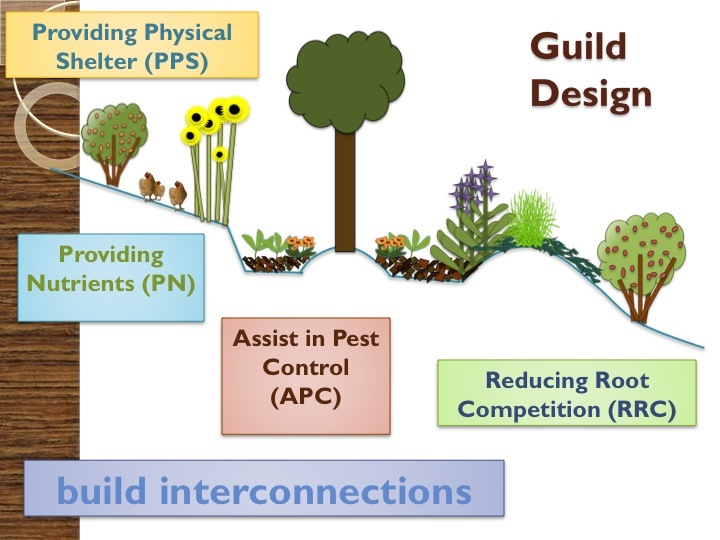 The three sisters shows the guild process of the diversity principle and use of biological resources. With the later, timing and management are the key which we adhered to the idea of planting the corn before the beans and squash. Thus in the course we dug and weeded an area for the corn and bean mounds with squash mounds interspersed every so often. The students got a chance to see how small-scale earthworks can provide good micro-climates for plants to thrive together as well. We dug numerous mounds and set eight seeds of a long ripening sweet corn that grew large and sturdily as this is needed for the beans to crawl on. The eight seeds were planted in four groupings marking the medicine wheel of the four directions with seeds in each hole to ensure even germination. The time and plant staking of the other plants will happen at a later date as mentioned earlier in the context of the use of biological resources. Additionally to complete the planting as most North American indians did, we planted a southern (northern in the other hemisphere) annual hedgerow/sun-trap of sunflowers and threw in cucumbers and vetch to make another similar guild as the three sisters. Maybe we can name this one the three cousins. 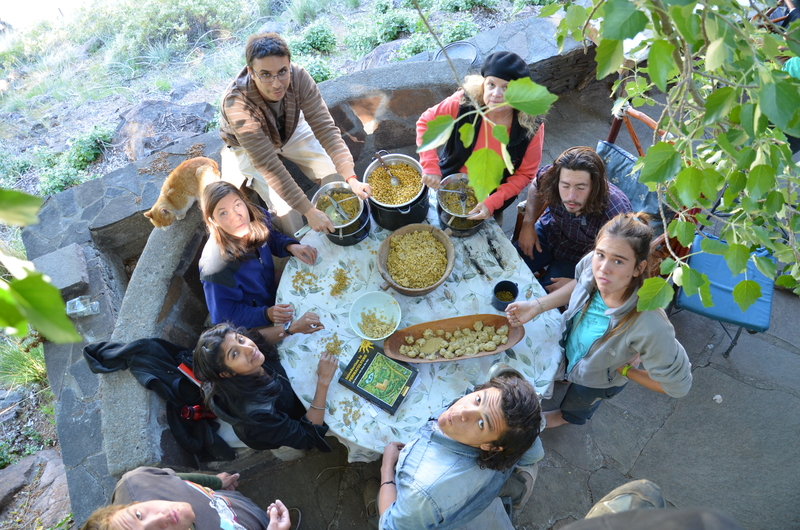 Another new thing we tried, even though it was in one of our normal sessions, was making chicha with the students. In addition to our normal sauerkraut mission, we also went for an alcohol fermentation experiment. THus after an intensive process of getting the corn ready with cooking it with lye for days, they peeled corn in the initial phase. the next one, which produced some hilarious faces, was chewing the corn and spitting it out into small balls. This mix had the liquid extracted and then put into a fermenting vessel with a water dilution. We had some beer at the end of the course for the no-talent show which wasn’t so bad, some even called it good. We also had good fun with making swales and learning about the simple aframe technique of surveying the land. Another great feature of the 16 day course was that again we had more time for hands on so we could combine the swale making with a session about how to use an aframe and how that corresponds to mapping. 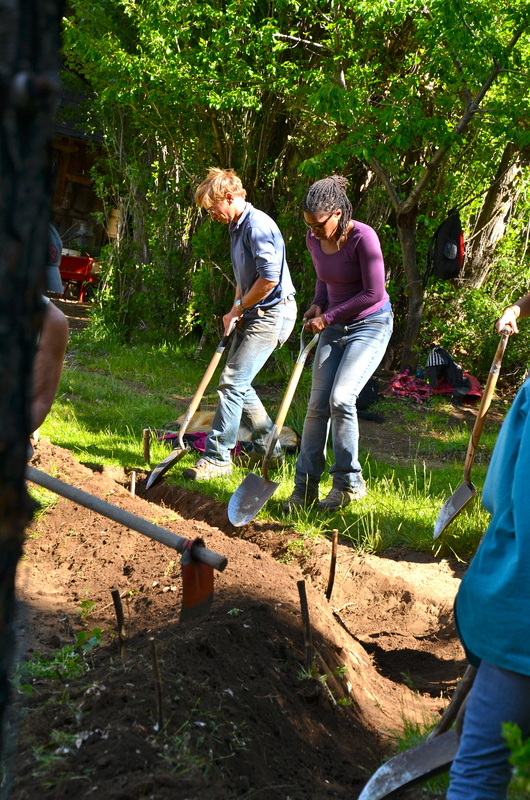 Thus we dug two swales to help with the water harvesting mission at the ranch. With the newest garden implementation led by Sara at the lower garden, we saw the potential for a hazardous flooding sector and decided we could harvest this water into swale. 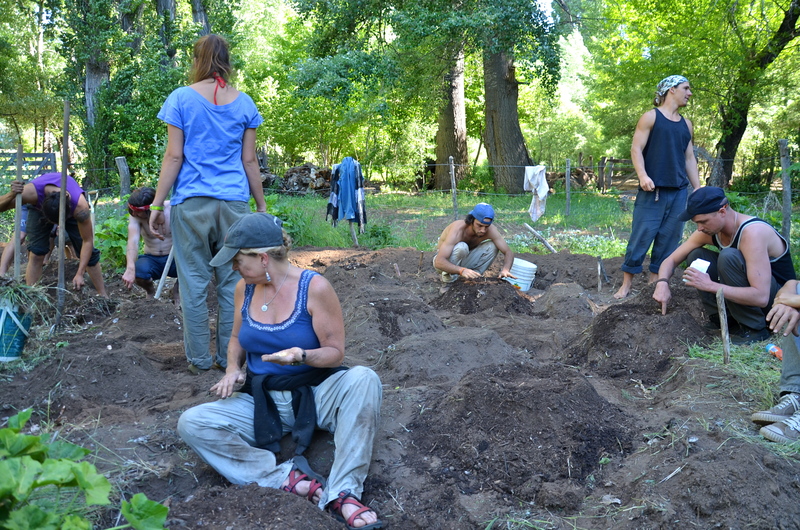 So broke into two groups and each had a go at digging the basin and piling up the berm, locating and creating a spillway, and then mulching the earthworks. While it is not the season for planting, we protected this newly moved earth with a thick layer of leaves from the piles that are around at the Estancia. However this fall we can plant some easily propagated plants out that require little water and that can be a part of our integrated pest management of the garden. They may only fill a couple of times a year but the swales will help with slowing, spreading and sinking what might be a potential erosion flow. Well in the end we had 12 students graduate, a small group but a nice one to experiment with the longer format. 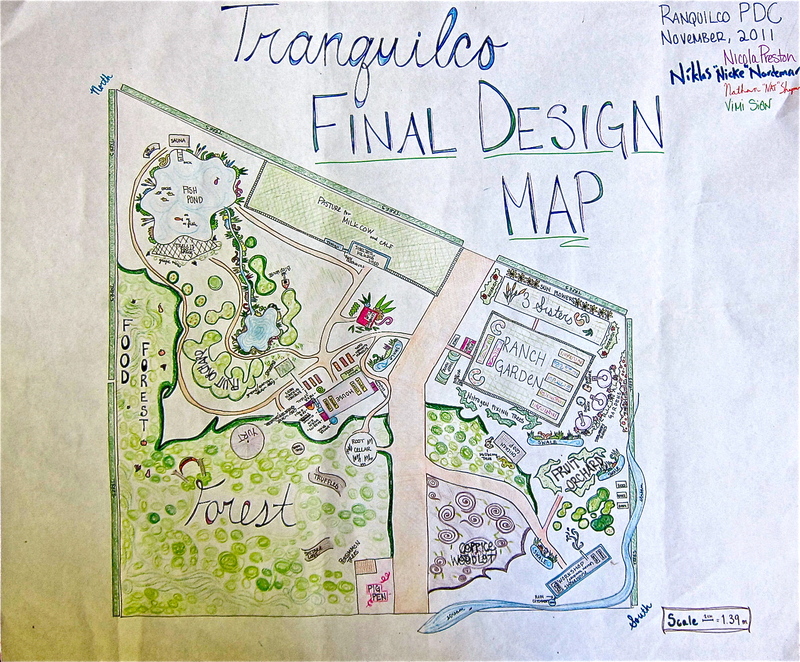 The extra time and a revised design process also seemed to produce a very nice in-depth design of a small plot of land on the “Shelf” at Ranquilco. 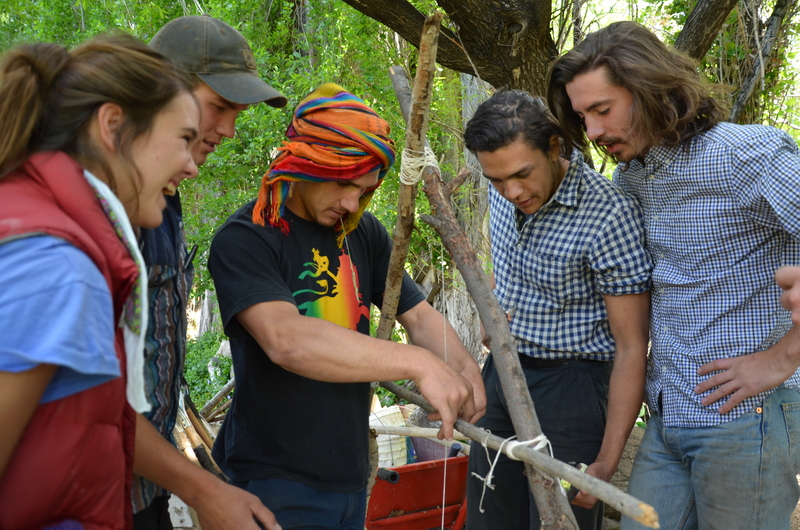 It was a bit of a mock design but with their desire to have long-term Permaculture happening leading to community self-reliance addressing housing and economic concerns is a must. Thus below is one of the fabulous and functional design that one of the groups came up with. Thanks to all who participated and who made it possible.